Whether you are preparing to install new brake pads or do a complete overhaul on your engine, you need to know where to go to buy quality car parts and accessories. 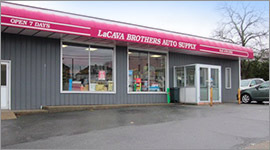 LaCava Auto Parts and Services has earned a solid reputation for providing top quality products to customers in the Greater Fall River area. For over 70 years, we have been a fixture in the local community, striving to be the very best auto parts store in Fall River and the surrounding area. We have the parts in stock that you need to get the job done, whether you are a commercial business, local repair shop, or individual car owner. If you need parts, equipment, and fluids for your car or truck, you can find it all at LaCava Brothers. You can use our online part look-up tool to find the right parts for the make, model, and year of your vehicle. We have parts for every job, including alternators and starters, A/C replacement parts, emissions, and chassis parts. We stock a wide variety of brakes, drums, rotors, and calipers if you need to install new brake pads and rotors, and we even keep a large selection of shocks, struts and springs on hand for our customers who need them. Automatic transmission parts, belts and hoses, electrical and wiring parts, and water pumps can all be found at LaCava Auto Parts and Services. Looking for sensors, performance parts, and valvetrain parts? You can find them all at our auto parts store in Fall River. 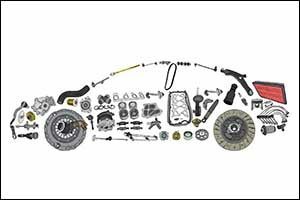 When we say that we have all the car parts and accessories you could ever need, we mean it. We also have transmission parts, fuel related repair parts, plus all of the fluids and filters you could ever want. We work with all of the top brands, including Interstate, AC Delco, Ford Motorcraft, CRP, Denso, Delphi, Gates, Moog, Fel-Pro, Pennzoil, Monroe, Timken, Wix, Walker, and Wagner, just to name a few. If you need something that we don’t have in stock, we also have a large selection of supply catalogs on hand for special orders. We even offer free delivery to customers in the Greater Fall River area. While you might not run a professional repair shop or own a commercial automotive business, you should still shop at LaCava Auto Parts and Services for all of your car parts and accessories. When you come to our auto parts store in Fall River, you will notice that it is not like other stores that sell automotive parts. If you need to install new brake pads or replace your belts and hoses, you can count on our team to help you get the parts you need for the specific make, model, and year of your vehicle. If you have any questions about the correct part number or other items that you might need to get the job done right, we can help point you in the right direction. In addition to car parts and accessories, we also carry all of the tools that you could ever need to perform the repairs, services, and renovations to your vehicle. Some jobs require specialized tools, or there are situations where you could save a lot of time and energy just by having a special tool. We carry everything you need to perform all of the services, repairs, and work that you want to accomplish, whether you are working in your home garage or at a professional repair shop. We also carry all of the chemicals, fluids, and other products you need to help keep your vehicle and garage in proper working order. If you work or live in the Greater Fall River area, make sure to stop by our store to see our full line of car parts and accessories. LaCava Auto Parts and Services has earned a solid reputation in the Southcoast area, providing our customers with top of the line products, tools, parts, and much more. Give us a call at 508-676-1951 or stop by our location on Bedford Street in Fall River, MA. Ask about our professional services, which include rotor turning services and hydraulic hose services, as well as free courtesy services for battery testing and windshield wiper installation.